Our Rodent Patrol was designed to drive away rodent vermin without chemicals or poisons. Plugging holes and keeping things clean will generally discourage infestation but sometimes you need some extra help. With Rodent Patrol you create a rodent repellent scent by placing the mixture in sachets, muslin bags or simply scattering the dried botanicals on shelves, inside cupboards, and around any suspicious point of entry. While humans find our botanical mixture strong but pleasant, rats and mice find it repulsive and will seek to avoid the areas where it is deployed. 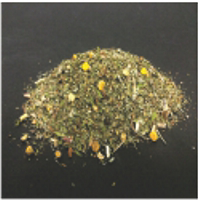 Each 1/2 lb bag contains a fragrant mixture of Peppermint, Spearmint, Blue Tansy and Wormwood. Send them packing. Product Contains:Peppermint, Spearmint, Blue Tansy and Wormwood.